Bookmark and save articles for reading later. Save news, blog or other articles directly from Safari, Twitter or any other app. 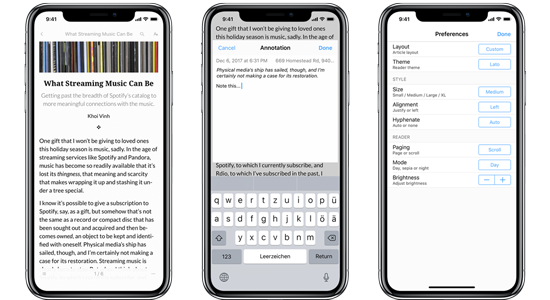 Read anything you saved later in an optimized format with custom styles for better readability and distraction-free reading. 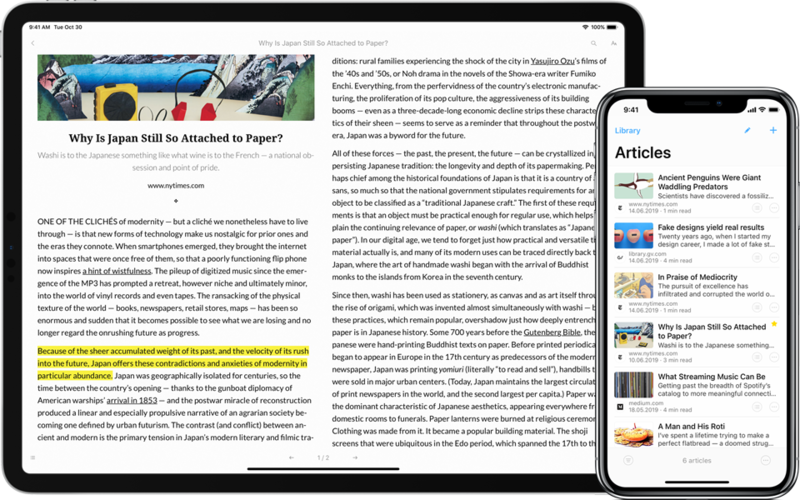 Save articles with just a click from Safari, Twitter or any other app by using the bookmark extension. Articles doesn't simply save links to those pages you want to return to. It also downloads their content and converts it to a minimal format. Read anything you saved later with just the essential text and images, without any headers, ads or clutter to get in the way. All content is stored on your device, so it even works offline. The reader's design is carefully crafted for articles and offers custom styles for better readability and distraction-free reading. Choose your favorite theme (Lato, Lora, Alegreya, Vollkorn, Open Sans, Merriweather, Iowan, Palatino), reading mode (day or night) and paging (scroll or page). The fluid layout dynamically adjusts all text properties and margins depending on your device and preferred style size (small, medium, large, extra large), giving you an optimal reading experience. The basic edition is free to use and includes all features. You can bookmark 30 articles each month at no cost. Upgrade to premium for more or unlimited articles. When you purchase a subscription, you are doing so through Apple's iTunes Store. Payments will be charged to your credit card of your iTunes account.